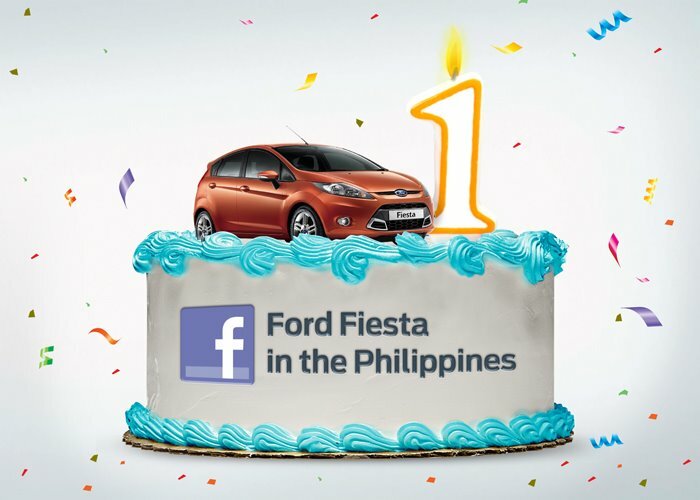 And then one day a post from Ford Fiesta Philippines said that they'll be having an anniversary party for Ford Fiesta owners, members should submit some requirements in order to be part of the event. So he did and a few weeks later he received a phone call confirming his attendance and informing him that he would receive his invite through email. This is what the invite looked and you need to put this on your windshield so you can enter the venue which was at MC Home Depot in Bonifacio Global City. This party was exclusive for Ford Fiesta owners and Ford's way of of giving thanks to its customers. The party started at around 3:00pm on October 15, 2011. It's cool to see more than a hundred Ford Fiestas in one place. Before the party even started some Fiesta owners joined the convoy from three different places and drive their way to Bonifacio Global City in Taguig. Three convoy meet-up places where at Shell Station in Macapagal Ave. near SM MOA, MC Home Depot in Ortigas and Shell Mindanao Ave. The convoys where were lead by 3 99.5 RT Fiesta cars. The food was ample and so was the entertainment and the games. Their food sponsors were Jollibee, Coca-Cola, Viva mineral water, Sabrett and Holy Kettle Corn. Ford also had a doodle car where the guests can write their birthday greetings. It was covered with a special sticker, of course they won't use a white-colored car just to have something where people can write. But I read from their FB page that they might put the car on display in one of their dealers or have the radio station 99.5 RT (another major sponsor) to drive it around the metro. Several bands played that day including mainstream musicians Paraluman and Ney Dimaculangan (former member of Sick Cycle Mind) and some up-and-coming bands that were pretty good! There were lots of prizes to be given away including a "Pimp My Ride" wherein an owner's car will be dressed up and it's worth 100,000 pesos of original Ford accessories and Concept One rims.. how sweet is that!? Unfortunately my "luck" was not at play anymore and our car was not pick during the raffle for this prize. And to top it all off, the Ford Fiesta endorser/ambassador (or should I say ambassadress) Toni Gonzaga graced the event. She was lovely and funny (and I like the jeans that she's wearing hehe)! When the Ford VP gave her a bouquet of flowers she joked: "Wow! Thank you for the flowers, I did not expect this... I was expecting another For Fiesta car..." LOL!!! Nice try Toni! Ford India has launched its global sedan,The All-New Fiesta is available in four premium trims, A new meaning to passenger safety, delivers class-leading fuel efficiency and Advanced Bluetooth Voice Control.